I started writing this post on March 1. WFMT’s Carl Grapentine kicked off March 1’s morning program by playing, what else? Various marches. I was just getting over February. The end of February was sufficiently balmy to lock it into the record books with January as being the first time both months went without snow in Chicago. 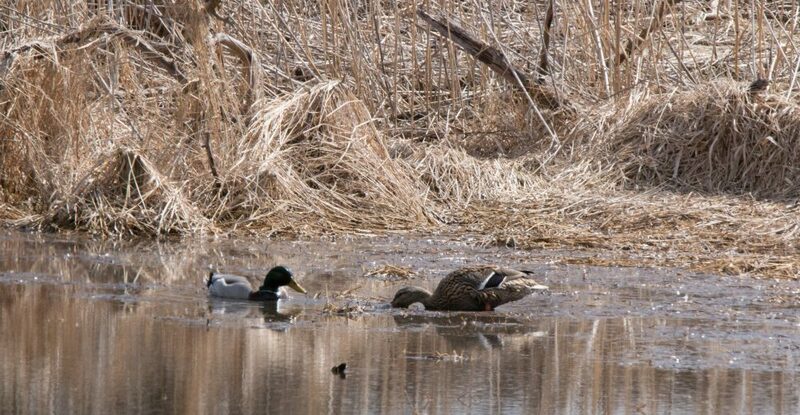 I birded with my friend Susan last Sunday. 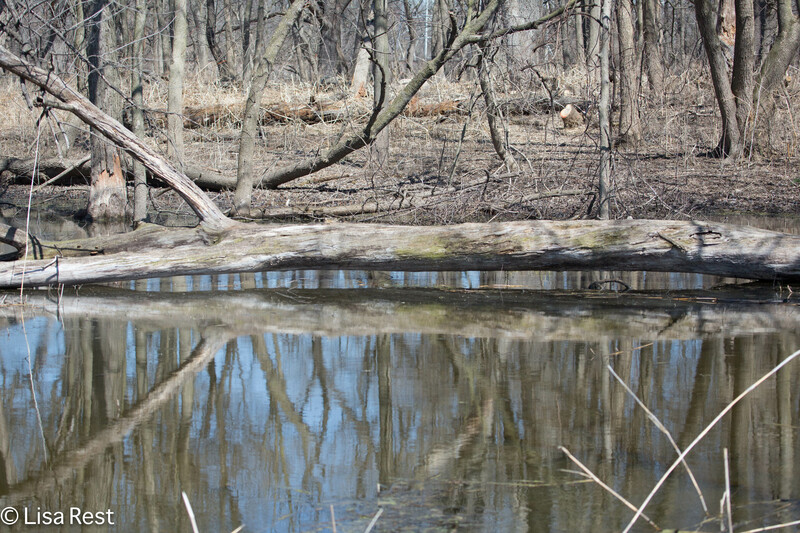 We went to Bemis Woods South and the Salt Creek Forest Preserve. It was so quiet I didn’t bother to do a list. We were about to give up on the Salt Creek portion when a man walking in the opposite direction told us to look for an owl, so we continued. 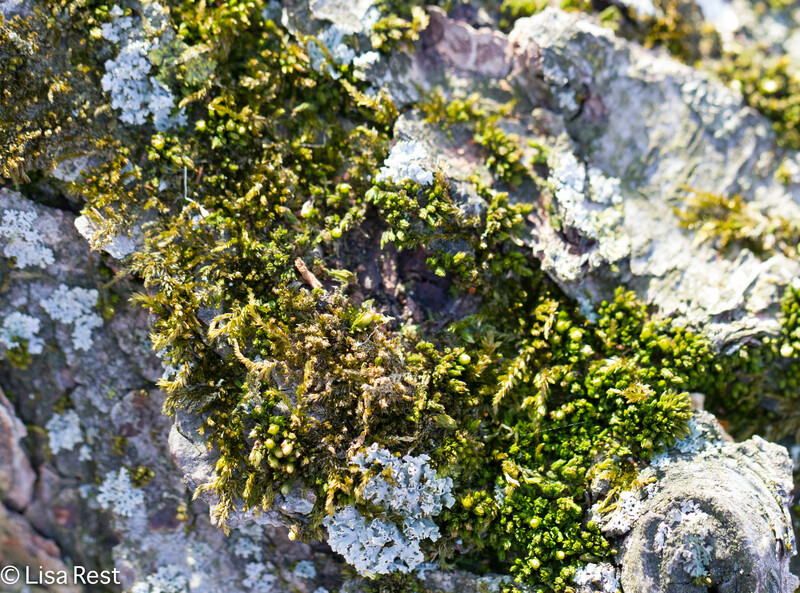 The Great Horned Owl at the top of this post made the day. Its nest was easily seen from the trail, and it sat and watched as people went by. 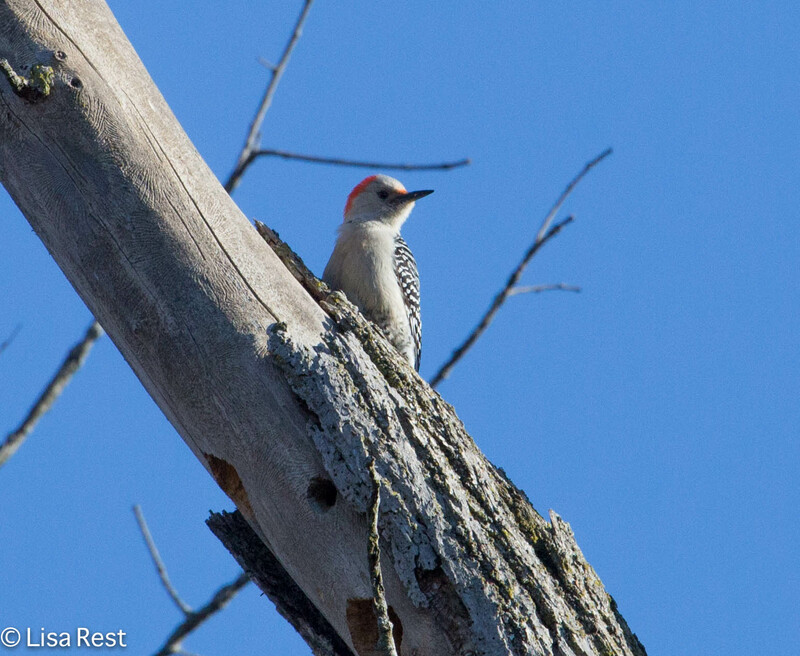 Two more birds from Bemis below, a White-Breasted Nuthatch and Red-Bellied Woodpecker. March came in like the proverbial lion, returning to chilly, windy temperatures. My reward for venturing out of the office last week was to see my first Yellow-Rumped Warbler in Millennium Park. Nothing rare, but an earliest first for me. 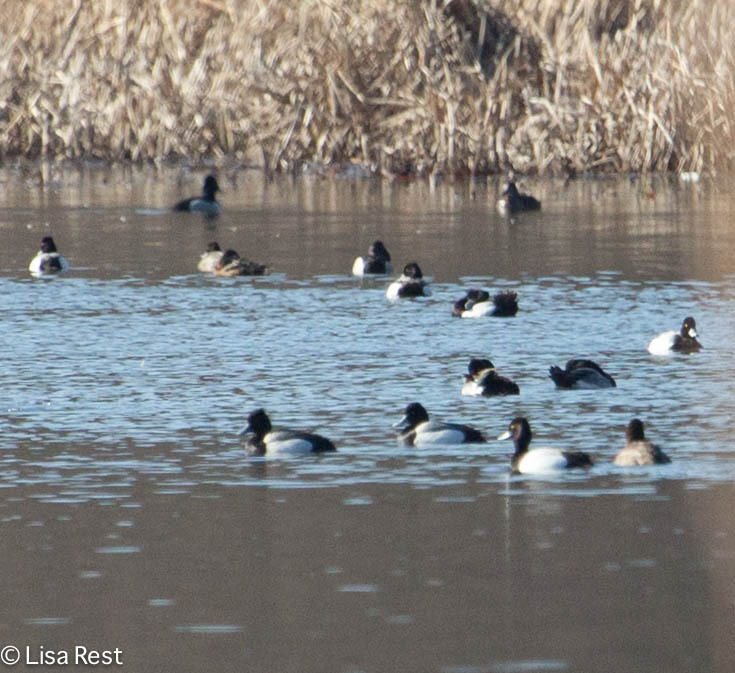 It’s a busy time of year for the birds, as they prepare for spring. 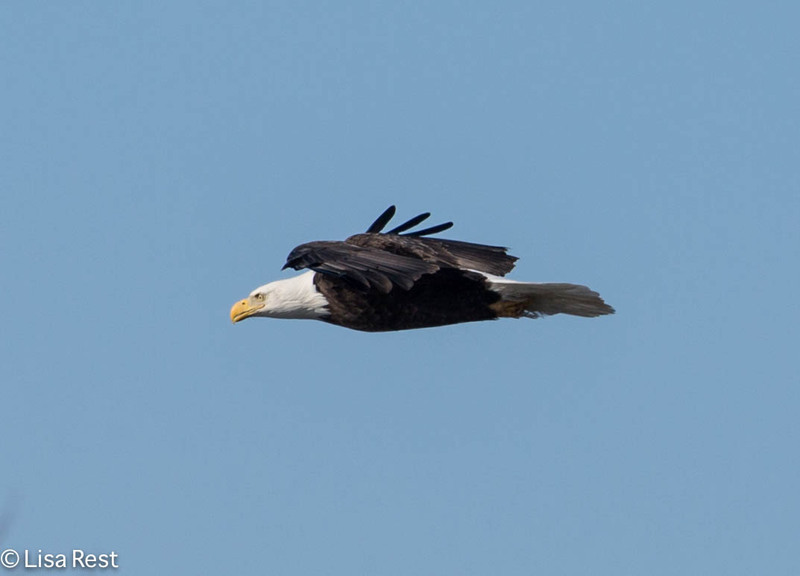 Today I visited the Chicago Portage, and although by the time I got there the sunny start was disappearing, and the number of Canada Geese and Mallards was increasing, and there were some more unusual visitors in the air, like the Bald Eagle below with nesting material and a small flock of Sandhill Cranes. The Sandhills were oddly quiet. 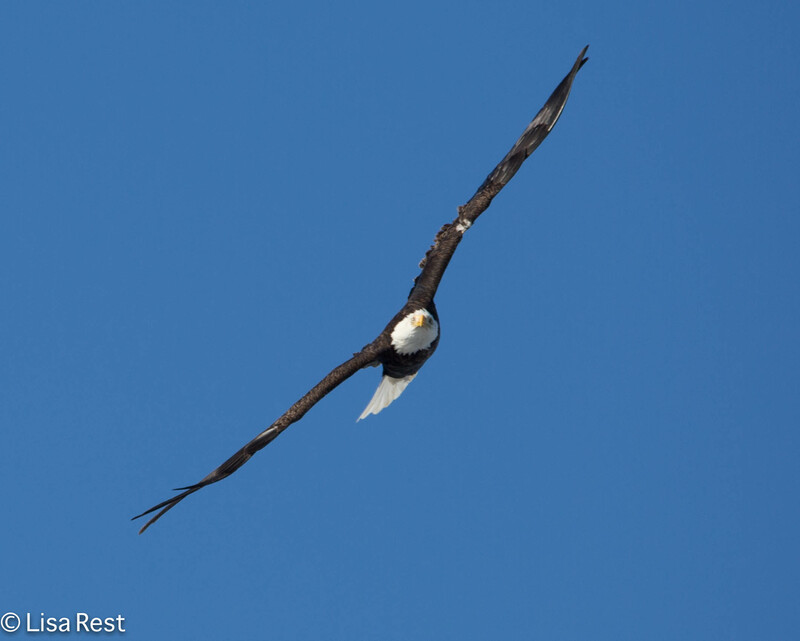 The Bald Eagle was flying east, but I have no idea where the nest might be. That direction was industrial, with the Sanitary and Ship Canal. 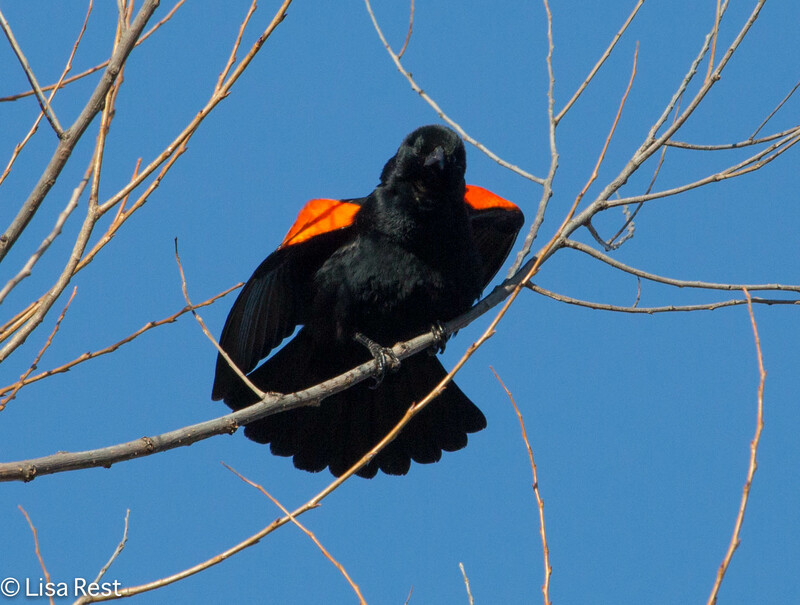 Saw and heard my first male Red-Winged Blackbirds today at the Portage, where they have come to establish territories. 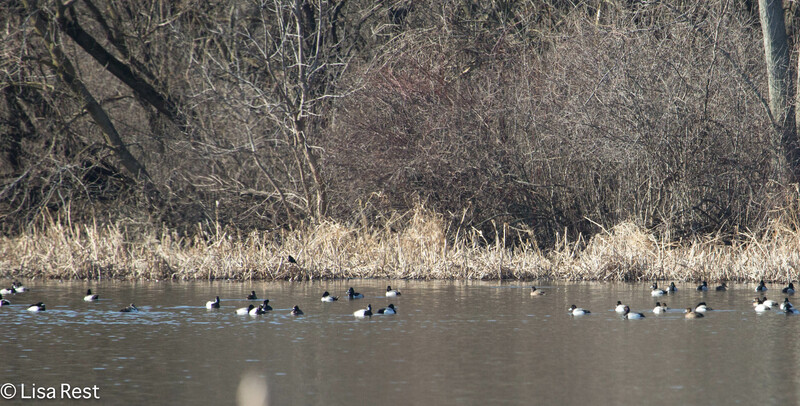 There were maybe 40 Mallards spread out wherever there was water, and 5 pair of Canada Geese were checking out nesting spots. 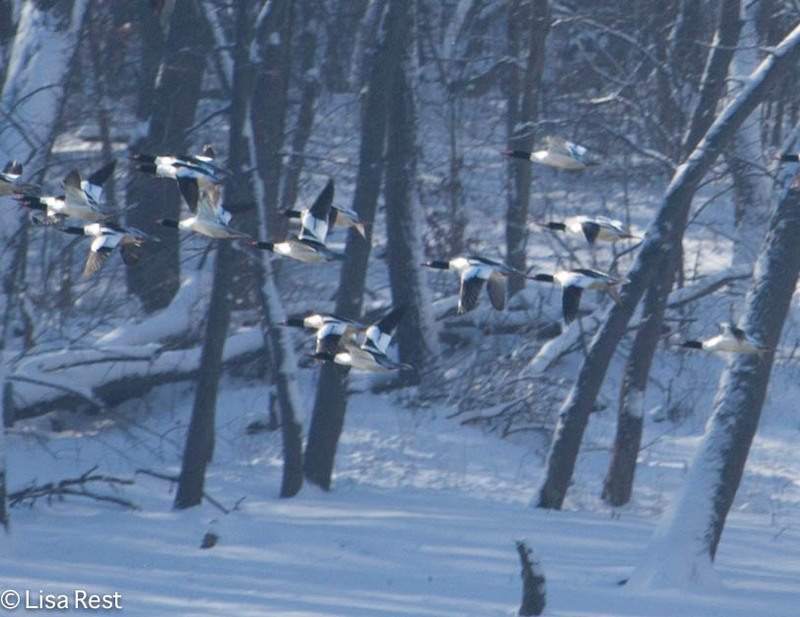 I haven’t seen any banded geese this year. Other than the Red-Winged Blackbirds there were very few passerines, with the exception of a few American Robins and European Starlings. I heard a Song Sparrow, Chickadees, Killdeer, and a couple Downy Woodpeckers were flitting about. 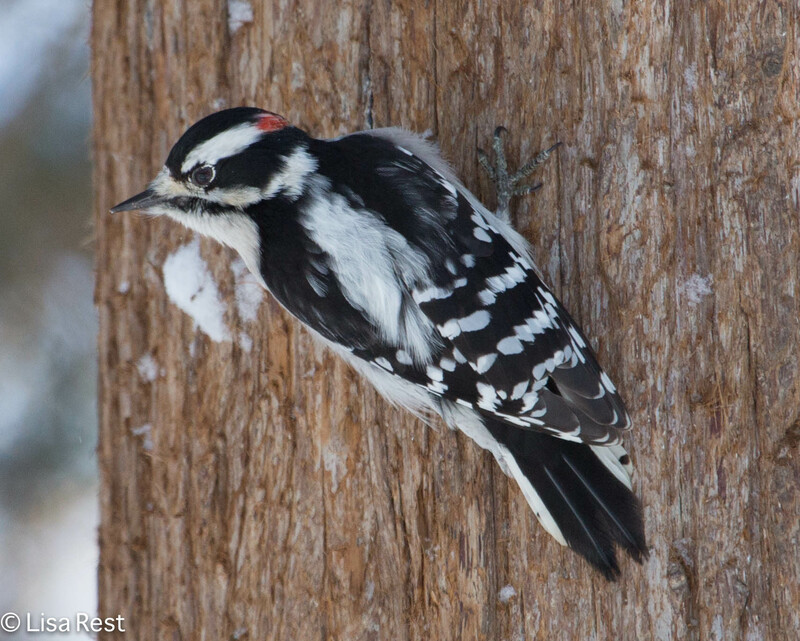 The last Downy Woodpecker I photographed was last week in Millennium Park. Also present that day, a couple Northern Cardinals and the White-Throated Sparrows who literally yelled their calls from the bushes when they saw me approach our favorite spot. I hope to be back once more if possible, with an update on my indoor crowd – before I leave for a quick trip to Panama. I’ve been planning this trip for months and unbelievably, all of a sudden it’s here. Thanks to you all for checking in. Until next time… Peace and Think Spring. 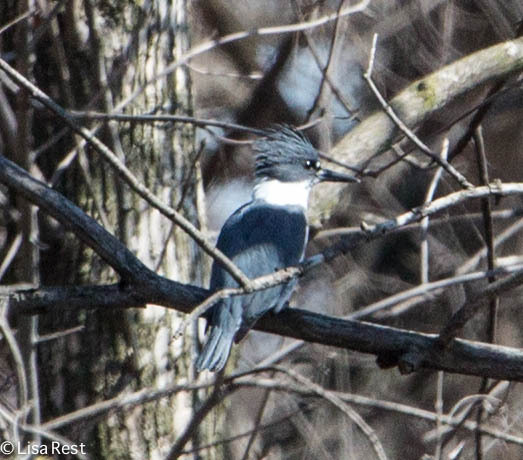 Here are some pictures from last Saturday’s Spring Bird Count. I did the morning half at McKee Marsh. I have yet to manage lasting long enough to do the afternoon half at Blackwell. It’s hard to get up at 3:00 AM on Saturday after working all week. Maybe next year I can take some vacation days to coincide with migration. There was still not much going on with warblers, although the storms we have had since have caused considerable fallout along the lakefront and likely this area too. 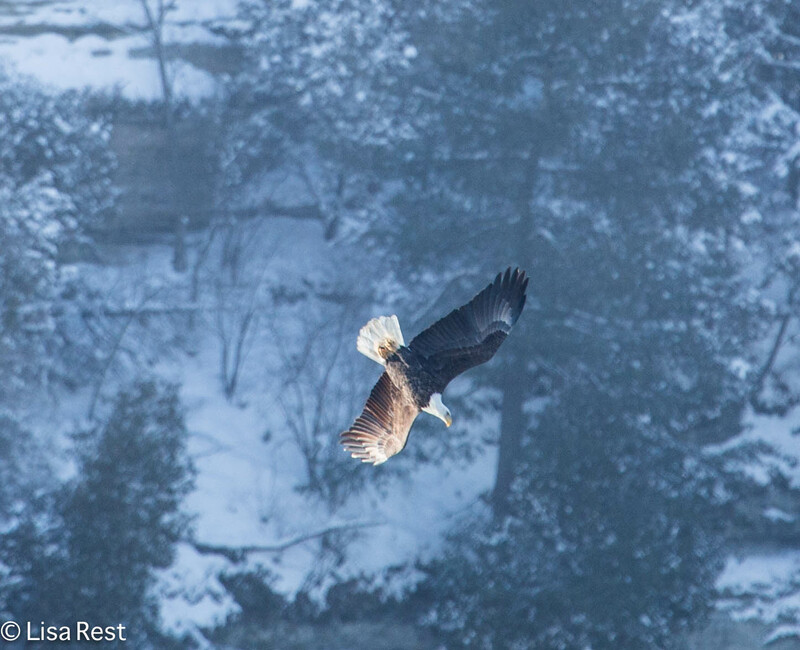 It was a pleasant surprise to get to the observation deck over the largest portion of water and see a contented looking Bald Eagle, who later reappeared in flight. Another Blue-Gray Gnatcatcher on yet another gray day. 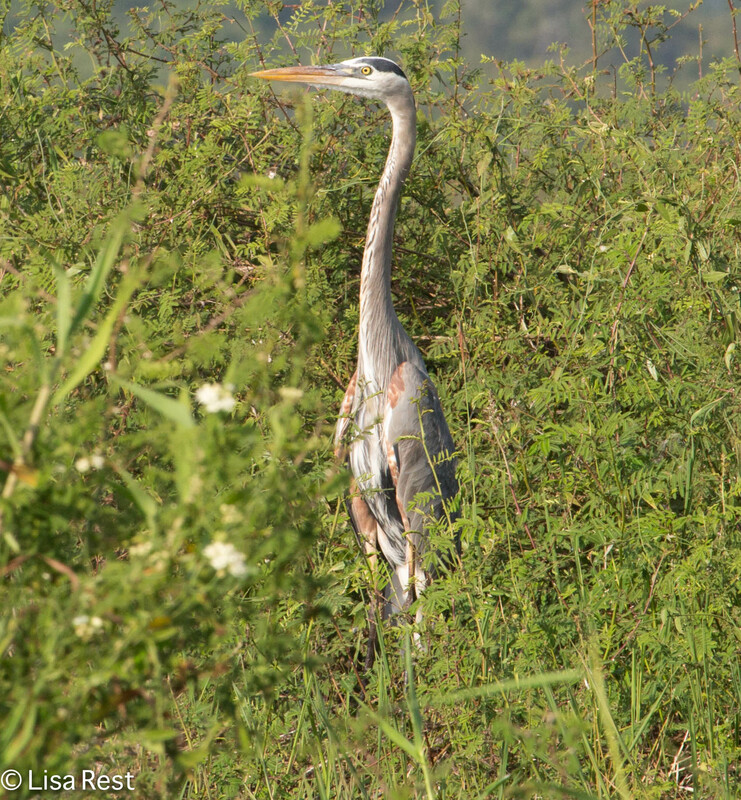 And there were more gray birds in and around the water…most everything was too far away to focus. 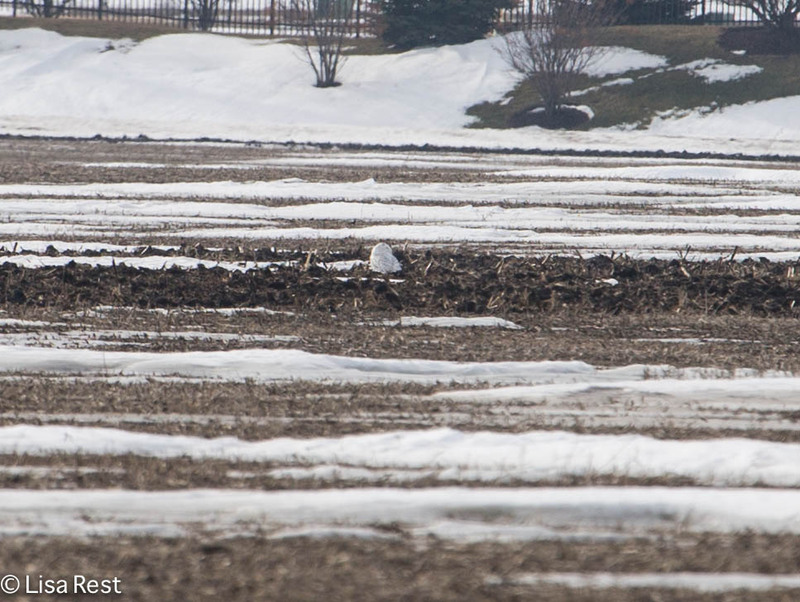 And it’s always special to see the return of Bobolinks. Red-Winged Blackbirds are getting down to business. We were lucky to accomplish as much as we did in spite of periods of rain. 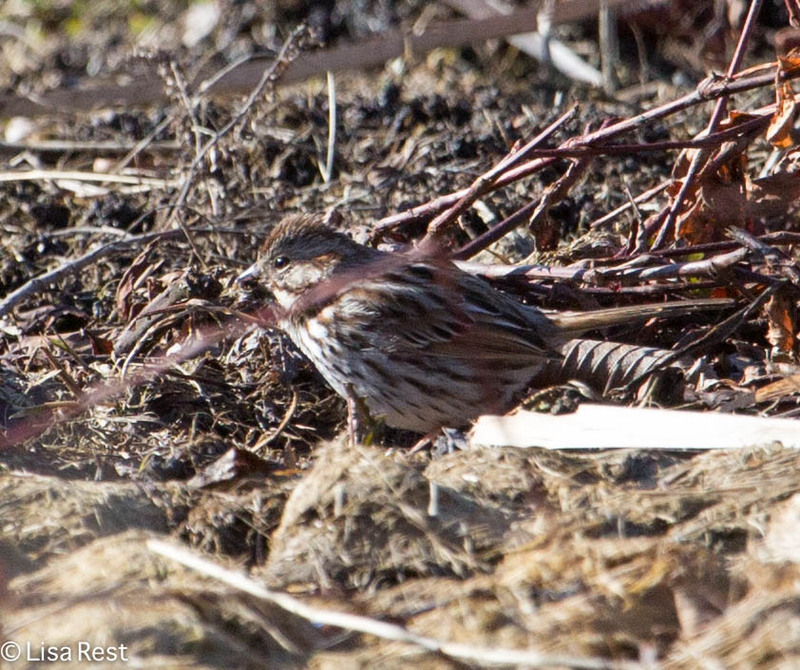 The Song Sparrow below did not let the lack of sunshine dampen his song. Except for brief warm spells, the weather is unseasonably cool, but the rain has caused the trees to leaf out in abundance, offering cover for many migrants while making them that much harder to see! I’ll be back soon with a small migration report from downtown Chicago. 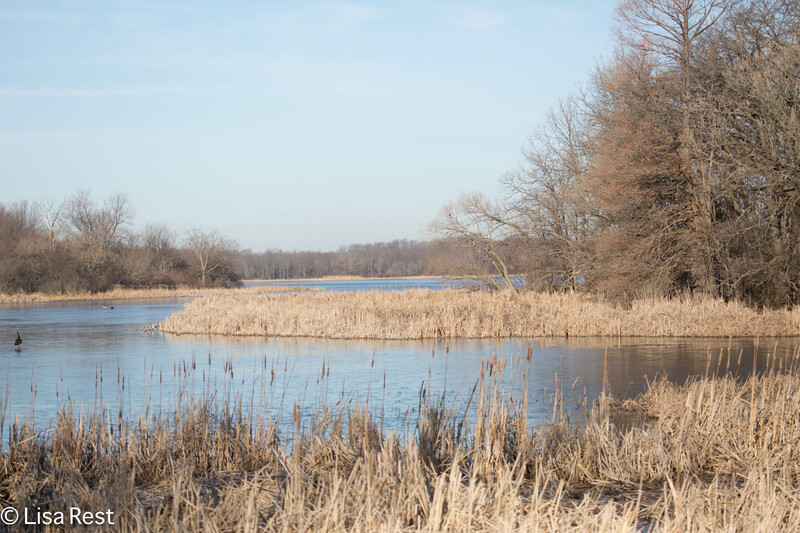 I may have said I didn’t want to get distracted in my last blog post, but I felt the need to go out for a little exploration Sunday morning, and so became distracted by a few birds at McGinnis Slough and the Chicago Portage. And if I don’t pay them due respect now they will likely never get another chance. I have been checking off all my little Signs of Spring since I got back: the appearance of the first American Robin in my yard last week, then hearing Robins singing in the neighborhood yesterday (looking forward to those 2:00 AM serenades! 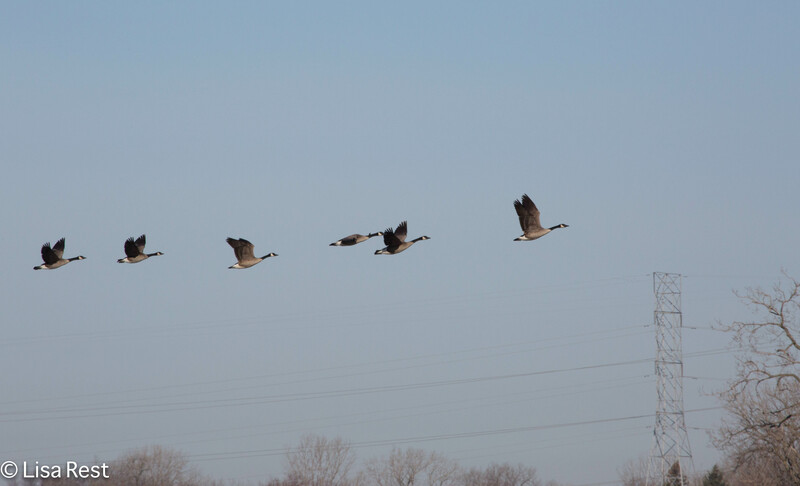 ), the Northern Cardinals singing their descending scale song, and I’m even distracted by the return of the Canada Geese to the Jackson Street Bridge. A Horned Grebe on the lakefront. Every year around this time someone sees a Red-Throated Loon by Monroe Harbor. I may have been the first to report one a few years back. I have missed the bird ever since but wonder if it’s the same individual returning year after year. It was cloudy, cold and windy on Sunday, perfect Red-Tailed Hawk weather at McGinnis. We have warmed up since then and have relatively balmy temperatures predicted for the entire work week, along with attendant rain and thunderstorms. The other raptor at McGinnis was a juvenile Bald Eagle. 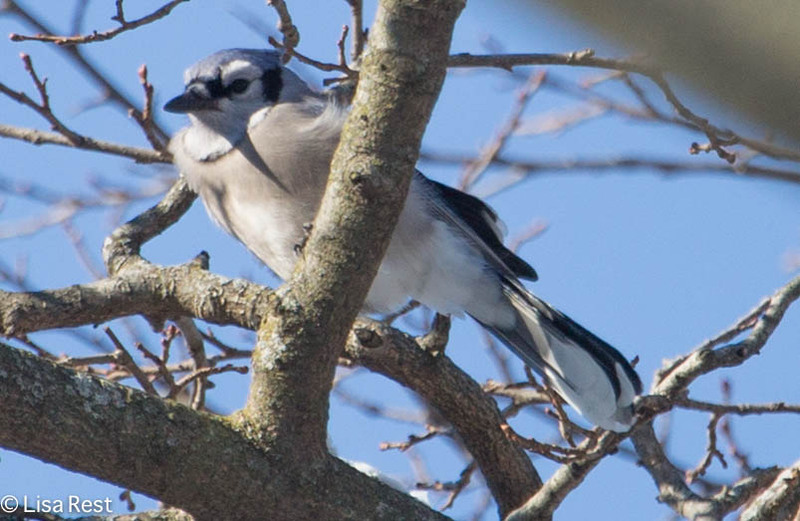 There are more and more frequent sightings of these birds in the Chicago metropolitan area. Not many surprises at the Chicago Portage but it was brimming with the promise of renewal. 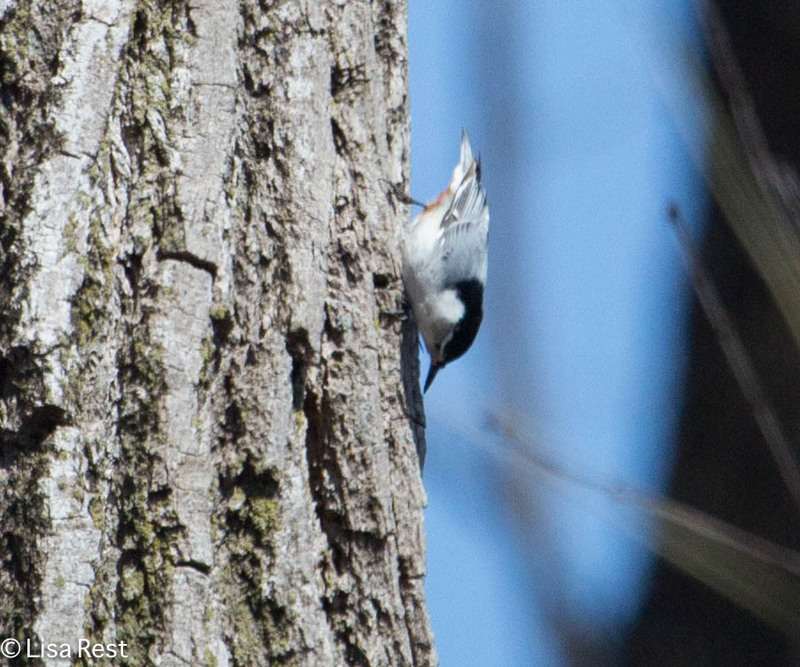 There were several White-Breasted Nuthatches and Downy Woodpeckers. One of the pairs of Canada Geese ready to set up housekeeping was the same tagged couple from the last two years, No’s. 16 and 11. If I recall correctly 16 is the male. This time I noticed the bands on their legs as well although they are not decipherable. 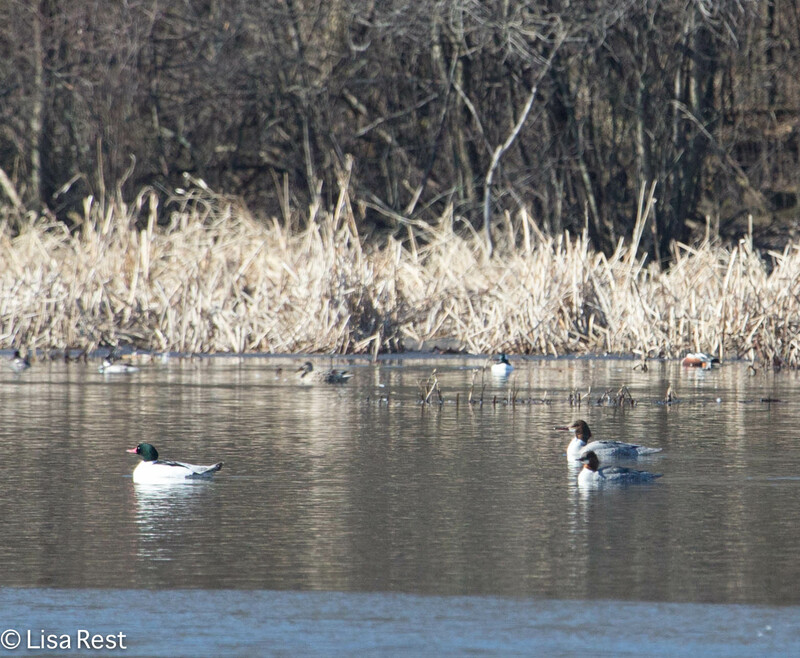 Among the Mallards and Canada Geese was one Northern Shoveler. I just barely managed to capture him before he took off. There were about a dozen Dark-Eyed Juncos but with the sweep of warm air coming in, this may be the last time I see them. I’m not changing the header on this page because I do intend to get right back to the photographs from Nicaragua! Maybe all the rain this week will keep me inside long enough to finish that task. Yesterday three of the Four Elles joined the DuPage Birding Club outing to Starved Rock in LaSalle County, Illinois. Although the fourth Elle could not join us, she participated in the same field trip with two of us last year. 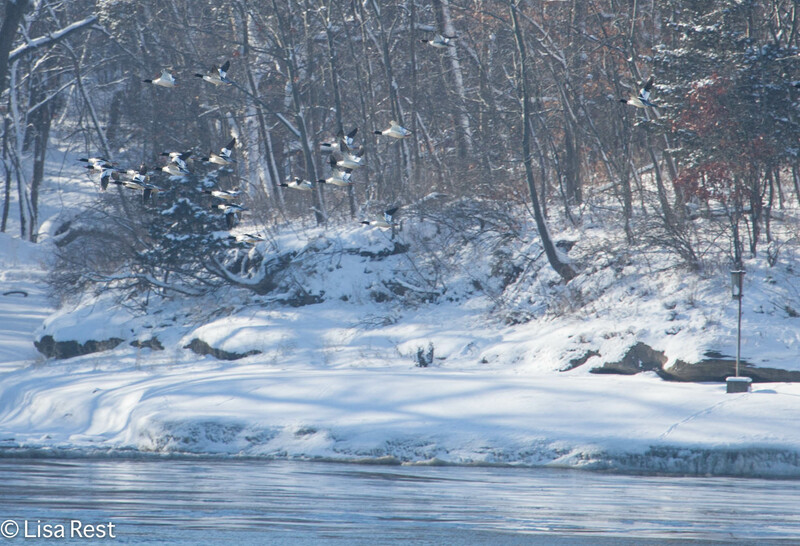 We met a large group of birders at the Lock and Dam across the river from the main entrance to Starved Rock State Park, where we watched birds on the Illinois River from the comfort and convenience of the deck behind the visitor’s center. 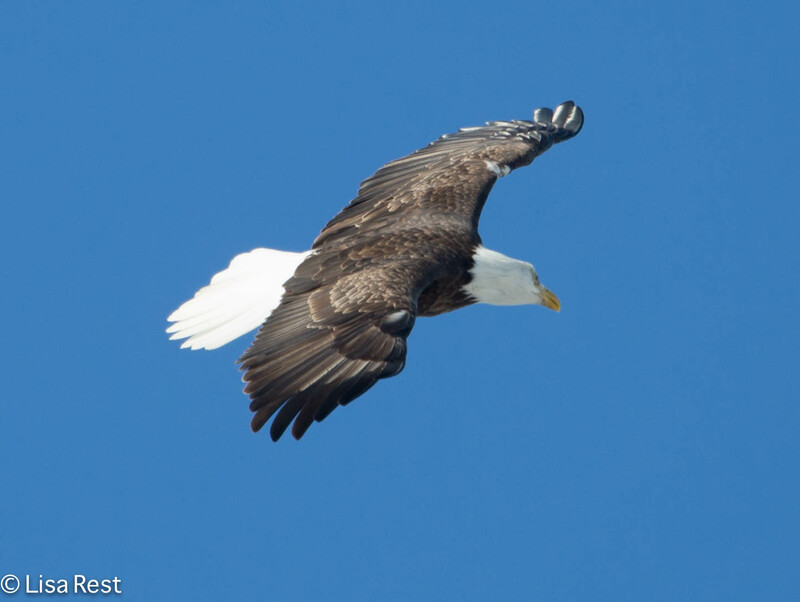 The Bald Eagle pictures are from this location. The birds were not always close enough, but they were active and in general viewing them turned out to be the highlight of the trip. 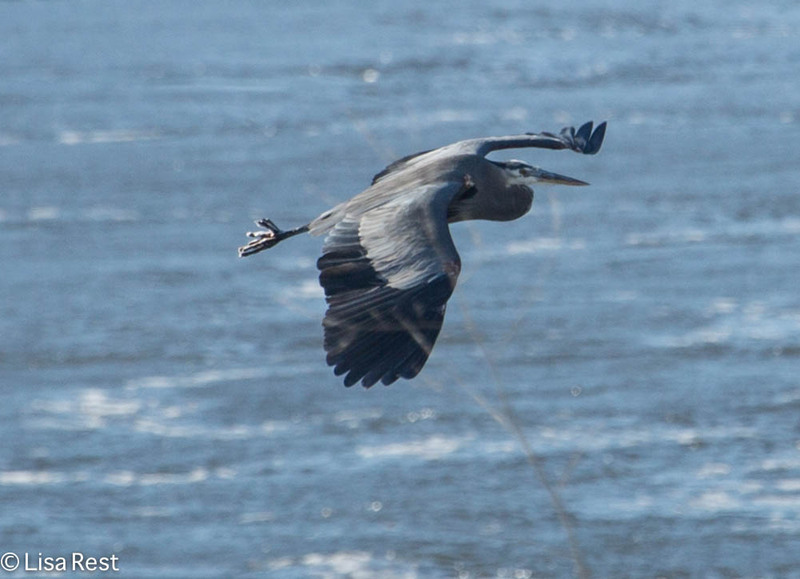 There were not many species of waterfowl, but we did have a couple Great Blue Herons, one of which is flying below. We then caravanned across the river to the visitor’s center adjacent to the lodge at the state park, where they have well-stocked bird feeders. There were many Blue Jays, not willing to sit still for the most part; this one looks pretty cold. 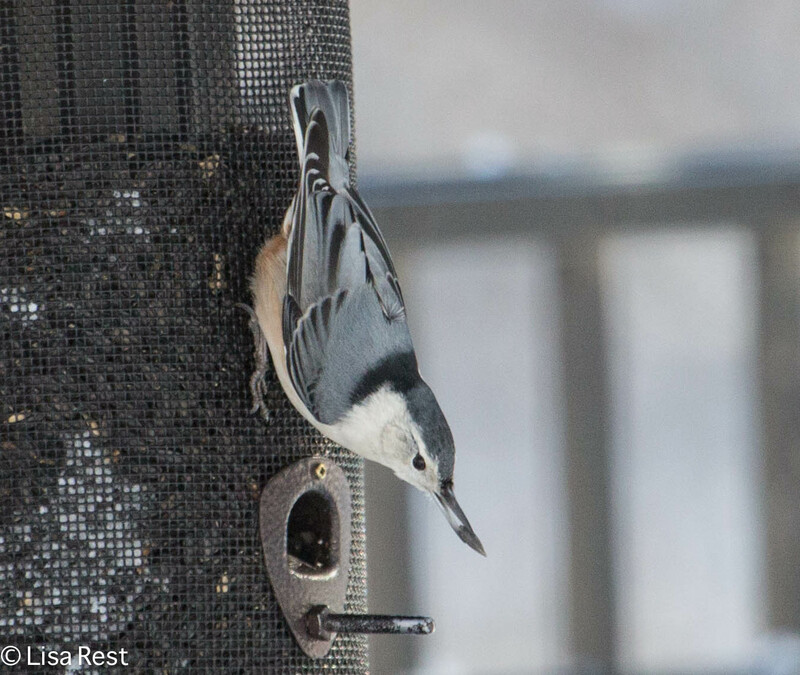 On and around the feeders, White-Breasted Nuthatches were common, like the one below. And invariably, we saw Downy Woodpeckers. And Tufted Titmouse, Dark-Eyed Junco, American Tree Sparrow and Black-Capped Chickadees, although less available for good shots. 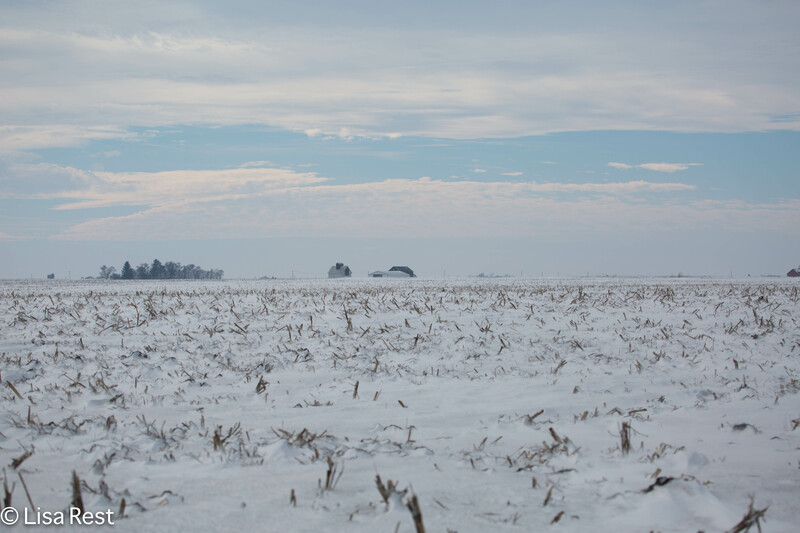 After lunch, the field trip took off for Lee County instead of further down the river this year, a change driven as much by the weather as the opportunity to search for a previously reported Snowy Owl. We scanned field after field like the one below. Unable to keep up with the 4-wheel drive vehicles in the blowing snow on the roads, after an hour or two we turned homeward and did not see the eventual Snowy. Luckily there are still opportunities closer to home.